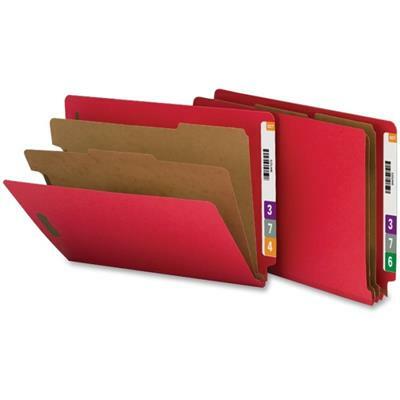 Classification folders with end tabs are ideal for the environmentally conscious office. Each folder is made with a high percentage of recycled content. 20 point, fiberboard, brown dividers with tabs and fasteners on both sides let you store information under several subdivisions. Fasteners on the front and back panels add two filing surfaces. 25 point covers offer bright colors to prevent misfiles. Folders easily accommodate letter-size documents with a 2"" expansion.